Oil reservoir souring is the production of hydrogen sulfide by sulfate-reducing microorganisms (SRM) in oil fields. Anaerobic respiration of sulfate is supported by various electron donors in petroleum reservoir ecosystems. Nitrate addition results in souring control by stimulating dissimilatory nitrate-reducing microorganisms (NRM) that directly or indirectly utilize petroleum-derived SRM electron donors. The oxidative capacity of nitrate for this process depends on NRM physiology and whether nitrate is metabolized to fully reduced end products or is partially reduced to nitrite. Production of nitrite is beneficial because it inhibits SRM. In laboratory tests, similar to nitrate, perchlorate also results in inhibition of microbial sulfate reduction by stimulating dissimilatory perchlorate-reducing microorganisms (PRM). The intermediates of perchlorate respiration include the potent oxidants, chlorate, chlorite, and dioxygen, which, like nitrite, are also highly inhibitory of SRM. The two approaches to souring control have interesting similarities and differences with respect to mode of action, and we discuss ways in which they could have beneficial synergistic interactions in a co-treatment approach to souring control. Other oxyanion inhibitors of souring are an interesting area of future research, and we summarize data on their modes of action and impact on different microbial subpopulations. Oil companies use various microbiological surveillance tools to monitor the success of nitrate injection or other souring control strategies. SRM surveillance traditionally relies on cultivation-based testing but in recent years has expanded to include cultivation-independent molecular and isotopic methods for detection and quantification of both harmful and beneficial oil reservoir microbes. The petroleum industry’s growing awareness of microbes and microbiology is due in part to the detrimental effects caused by anaerobic sulfate-reducing microorganisms (SRM). Reservoir souring is caused by microbial reduction of sulfate to sulfide by sulfate-reducing bacteria or archaea in the presence of appropriate nutrients, substrates, or conditions that get introduced during oil recovery operations. For example, seawater injection for production pressure maintenance both introduces sulfate and alters the formation temperature near the injection well, creating conditions permissive for SRM. Negative consequences of souring are many and include health and safety concerns (H2S is a deadly gas), increased sulfur content in produced oil and gas, and SRM-influenced corrosion. Different souring control strategies exist. Sulfate removal from injection water by nanomembrane filtration has been demonstrated; however deployment is costly, technically challenging, and hence not widespread (Alkindi et al. 2013). More common are physical or chemical removal of H2S post production (Jensen and Webb 1995) and the application of biocides to kill or inhibit reservoir SRM (Telang et al. 1998; Greene et al. 2006). Oil companies have widely used nitrate injection technology for souring control (Torsvik and Sunde 2005), and perchlorate treatment is an alternative approach that is gaining recognition and is likely to be tested in the field soon (Coates 2014; Carlson et al. 2014). Adding nitrate or perchlorate stimulates dissimilatory nitrate-reducing microorganisms (NRM) or dissimilatory perchlorate-reducing microorganisms (PRM), respectively, which can prevent or reverse the souring reactions catalyzed by SRM (Fig. 1). The two approaches share some similarities, but there are also important differences as the physiology and ecology of the respiratory processes are distinct. Managing reservoir microbial communities in this way is the focus of the present chapter. Oil reservoirs represent complex microbial ecosystems featuring various interactions between different groups of anaerobes. These reduced environments are rich in electron donors but contain relatively few terminal electron acceptors. In this context, methanogenic degradation of petroleum hydrocarbons over long timescales is catalyzed in situ by consortia of reservoir microbes (Head et al. 2003). Secondary oil production (i.e., water injection to maintain in situ reservoir pressure and provide a water sweep of oil through the reservoir) can alter the microbial ecosystem dramatically by introducing oxidants – particularly sulfate when seawater is injected at offshore operations. Subsequent nitrate or perchlorate injection for souring control can affect the microbial ecology even further, resulting in interconnected anaerobic carbon, sulfur, nitrogen, and/or chlorine cycling. Understanding these cycles and the interactions between SRM and NRM/PRM is of critical importance for smart management of reservoir souring problems. The importance of reservoir souring is reflected by an increasing body of primary scientific literature, much of which is cited in several good reviews of souring and souring control (Eckford and Fedorak 2004; Birkeland 2005; Thrasher and Vance 2005; Torsvik and Sunde 2005; Grigoryan and Voordouw 2008; Ollivier et al. 2009; Gieg et al. 2011). The current chapter will focus specifically on aspects of SRM, NRM, and PRM physiology that are relevant to reservoir souring and souring control (Sects. 2 and 3, respectively). Different strategies oil companies use for monitoring microorganisms in oil-field settings will also be discussed (Sect. 5). Souring is a likely outcome following seawater injection into oil reservoirs, which brings the terminal electron acceptor sulfate into contact with various electron donors in the organic-rich petroleum hydrocarbon environment. Essential nutrients (N, P, etc.) may be present both in injected water and in the reservoir. Microorganisms are widely believed to be indigenous to oil reservoirs, but they may also be introduced with the injected water. Oil-field SRM detected and characterized to date are physiologically and phylogenetically diverse, ranging from mesophilic Deltaproteobacteria to hyperthermophilic archaea to spore-forming mesophilic, thermophilic, and halophilic Firmicutes (Ollivier et al. 2009; Gittel et al. 2009; Aüllo et al. 2013; Vigneron et al. 2017). The physiology of oil-field SRM (e.g.,temperature and substrate range) can provide clues as to whether they are indigenous to a given reservoir habitat or introduced (Magot 2005). The chief concern here however is the production of sulfide, which is problematic for the oil industry regardless of the provenance of the culprit SRM. Electron donors for sulfate-reducing microorganisms in anoxic environments are often organic acids, alcohols, and hydrogen that may be by-products of fermentative degradation of complex organic compounds. Organic acids, alcohols, and hydrogen are utilized by several characterized SRM from oil-field environments (Birkeland 2005; Grigoryan and Voordouw 2008), and organic acid anions are detectable in oil reservoir fluids (e.g., Barth 1991). Other potential electron donors in oil reservoirs are obviously petroleum hydrocarbons. SRM that oxidize alkanes, cycloalkanes, and aromatic compounds anaerobically have been isolated from various environments (Widdel et al. 2009); however few of the SRM detected in or isolated from oil fields described so far share this phenotype (Harms et al. 1999; Magot 2005). Although future efforts may uncover more oil-field isolates that couple hydrocarbon oxidation to sulfate reduction, the paucity of examples to date questions whether in situ reservoir souring is driven directly by hydrocarbons or rather by other electron donors. Alternatively, SRM could be indigenous reservoir inhabitants that have a different lifestyle prior to industrial oil recovery activities. Anaerobic biodegradation of oil in situ involves microbial consortia that degrade hydrocarbons into acetate and hydrogen that are consumed by methanogens (Zengler et al. 1999; Head et al. 2003; Jones et al. 2008). When sulfate is scarce or absent, some SRM carry out fermentative metabolism and can serve as syntrophic partners for methanogens (Bryant et al. 1977; Muyzer and Stams 2008). Such organisms may switch from fermentation to sulfate reduction following injection of sulfate-rich seawater into an oil reservoir. A related possibility is that introduction of sulfate to a previously methanogenic system results in the competitive exclusion of methanogens by acetate- or hydrogen-oxidizing SRM. In this scenario reservoir souring would be driven directly by small organic acids and hydrogen produced by ongoing biodegradation of petroleum hydrocarbons; i.e., the early steps in oil degradation pathways would not change, but these processes are enabled by end members consuming acetate and hydrogen via sulfate reduction rather than methanogenesis. The extent of reservoir souring in the presence of abundant sulfate depends on the amount of electron donors and trace nutrients present to support the growth of SRM. Souring may also be limited by the presence of toxic or inhibitory compounds in petroleum that interfere with SRM metabolism (Torsvik and Sunde 2005), and temperature, salinity, pH, and mineral scavenging must also be considered (Johnson et al. 2017; Pannekens et al. 2019). These limiting factors form the basis for industrial strategies to combat SRM activity. Traditionally the introduction of toxic biocides has been used to curb microbial growth, inhibiting SRM in particular. Biocides are also toxic for humans and marine life (Greene et al. 2006). Biocide effectiveness is dependent on proper dosing regimens and the degree to which target microbes develop biocide resistance (Sanders and Sturman 2005). Other oxyanion treatments, such as molybdate, have also been long considered as selective inhibitors of sulfate reduction (Postgate 1952), although their use has largely been limited to ecological studies (Oremland and Capone 1988). Nitrate injection technology is currently the most widely used approach in the oil industry to control souring and is primarily based on a strategy to deplete SRM electron donors via nitrate reduction instead of sulfate reduction. Perchlorate injection is a newer approach to souring control that is based on similar mechanisms. Both nitrate and perchlorate represent alternative, more energetically favorable electron acceptors and can outcompete SRM for electron donors and thus limit SRM growth through this biocompetitive exclusion. Nitrate reduction can additionally result in the accumulation of nitrite, and perchlorate reduction can result in the accumulation of chlorite, both of which are potent SRM inhibitors (Carlson et al. 2014) and are therefore similar to a biocide. Effects of nitrate and perchlorate addition on the microbial ecology of sour reservoirs are elaborated upon below. Nitrate is incorporated into waterflood regimes for many sour oil reservoirs to combat the activity of SRM. Like SRM, NRM can utilize various oil-derived electron donors, coupling their oxidation to the reduction of nitrate instead of sulfate. Hydrocarbons, organic acids, alcohols, and hydrogen can all be metabolized by different NRM. Furthermore, sulfide and other reduced sulfur compounds potentially present in the reservoir environment can also be coupled to the reduction of nitrate by chemolithotrophic NRM (e.g., nitrate-reducing sulfide-oxidizing microorganisms, NR-SOM) (Lahme et al. 2019). Hence nitrate reduction has the potential to prevent reservoir souring by competitive depletion of SRM substrates or by the direct oxidation of the harmful hydrogen sulfide (Fig. 1a). Thermodynamic modeling predicts that chemoorganotrophic NRM are favored over chemolithotrophic NR-SOM under reservoir conditions (Dolfing and Hubert 2017). Informed management of the sulfur cycle in nitrate-treated oil reservoirs depends on understanding and distinguishing between nitrate reduction pathways (Hubert et al. 2009). SRM activity can also be adversely affected by increased environmental redox potential due to the production of nitrate reduction intermediates (Nemati et al. 2001a). Nitrite is a main intermediate and has the added beneficial properties of inhibiting sulfate reduction directly as an alternative substrate of the dissimilatory sulfite reductase (Dsr) (Greene et al. 2003). Nitrate can also chemically scavenge sulfide that may be present (Sanders and Sturman 2005). Perchlorate injection is an emerging approach to souring control that has many similarities with nitrate treatment. Perchlorate is utilized by perchlorate-reducing microorganisms (PRM) that can outcompete SRM for consumption of oil-derived electron donors (Coates et al. 1999; Carlström et al. 2013; Engelbrektson et al. 2018a, b). PRM can also oxidize sulfide, but primarily to elemental sulfur rather than to sulfur oxyanions (Gregoire et al. 2014; Mehta-Kolte et al. 2017). Elemental sulfur accumulation is a relevant consideration, given that it may be subsequently oxidized or reduced (Telang et al. 1999), and if it comes into contact with production facilities, it can exacerbate corrosion problems that are known to be associated with reservoir souring (Lahme and Hubert 2017; Lahme et al. 2019). While both nitrate and perchlorate can function as competitive inhibitors of sulfate reduction, perchlorate is a slightly more potent direct inhibitor of SRM (Carlson et al. 2014). Finally, reactive chlorine and oxygen species, like nitrite, are potent inhibitors of sulfate reduction (Carlson et al. 2014). Depletion of SRM substrates by NRM as a souring control strategy is sometimes referred to as biocompetitive exclusion (Fig. 1a). This is based on nitrate reduction being more thermodynamically favorable than sulfate reduction when coupled to the oxidation of a given substrate. Oil-field NRM stimulated by nitrate injection may, like SRM, be indigenous to the reservoir or introduced during water injection. Nitrate injection technology has gained broad attention from the petroleum industry only recently, and fewer oil-field NRM have been isolated and characterized, compared to SRM. Unlike oil-field SRM described so far, many characterized chemoorganotrophic NRM from oil fields can oxidize hydrocarbon electron donors (Ollivier and Cayol 2005). In order for biocompetitive exclusion to be successful, the NRM must oxidize the same substrates that the SRM would otherwise couple to the reduction of sulfate. Petroleum reservoirs represent complex microbial ecosystems and substrate utilization patterns for anaerobic respiration by oil-field SRM, and NRM will not necessarily be identical (Grigoryan and Voordouw 2008). For example, in one low-temperature oil field in western Canada, it has been observed that NRM oxidize aromatic hydrocarbons, whereas SRM predominantly use organic acids (Agrawal et al. 2012). Similar to NRM, PRM outcompete SRM for electron donors due to the favorable thermodynamics of perchlorate reduction over sulfate reduction. Perchlorate is widespread in the environment and is present both as a contaminant and as a natural product owing to photooxidative processes in the upper atmosphere. PRM are therefore ubiquitous in the environment and present in both marine and freshwater systems (Coates et al. 1999; Carlström et al. 2013). In general, PRM are less abundant than NRM most likely due to the fact that nitrate is usually present at several orders of magnitude higher concentrations. However, while denitrification (nitrate reduction to N2) provides five electrons per mole, perchlorate provides eight electrons per mole. Thus, from the standpoint of biocompetitive exclusion, fewer moles of perchlorate versus nitrate are required to consume the same amount of labile carbon sources and outcompete SRM if the nitrate reduction proceeds via denitrification. These points are well illustrated in flow-through column studies to assess the capacity of perchlorate and nitrate to inhibit sulfate reduction. While it takes longer for perchlorate to show an impact on sulfate reduction compared to nitrate, at equimolar concentrations, perchlorate is more effective than nitrate and inhibiting sulfate reduction (Coates 2014). Some oil-field NRM catalyze dissimilatory nitrate reduction to ammonia (DNRA) (Fig. 2a) (Hubert and Voordouw 2007), which also provides eight electrons per mole of nitrate. Further work is needed to address whether nitrate injection promotes DNRA or denitrification by NRM in different reservoir contexts. PRM are also capable of using a variety of organic acids as well as crude oil hydrocarbons as electron donors and carbon sources to support growth. Of note, because PRM produce oxygen as an obligate intermediate of their anaerobic metabolism, PRM are able to activate hydrocarbons through aerobic pathways in anoxic environments (Coates et al. 1998; Carlström et al. 2013). This capacity for oxygenic hydrocarbon degradation may give PRM an additional advantage over SRM in oil reservoir environments. If SRM causing reservoir souring can switch their metabolism to reduce the injected nitrate instead of sulfate (Seitz and Cypionka 1986; Dalsgaard and Bak 1994; Plugge et al. 2002), then sulfide production will stop, and electron donor depletion is not necessary. However, not all oil-field SRM can reduce nitrate (Greene et al. 2003). Many SRM also have mechanisms for detoxifying reactive nitrogen species (e.g., nitrite, nitric oxide). Similarly, some thermophilic SRM have been shown to reduce perchlorate (Liebensteiner et al. 2013, 2014), although the exact mechanisms for this remain obscure. Several NRM isolated from oil-field environments couple nitrate reduction to the oxidation of sulfide and other reduced sulfur compounds (Fig. 1b) making them potentially beneficial souring-control agents. The product of sulfide oxidation may be sulfur compounds of an intermediate oxidation state (e.g., elemental sulfur) or sulfate. Intermediate sulfur compounds are corrosive (Nemati et al. 2001b; Hubert et al. 2005; Lahme and Hubert 2017; Lahme et al. 2019), and their accumulation may be prevented if microbes that reduce or oxidize elemental sulfur are present (Telang et al. 1999; Gevertz et al. 2000). Complete conversion of sulfide back to sulfate allows further sulfate reduction to occur if SRM electron donors remain available. In principle nitrate can deplete these electron donors via cycling of reduced and oxidized sulfur compounds between chemolithotrophic NRM and sulfate or sulfur reducers (Fig. 1b). 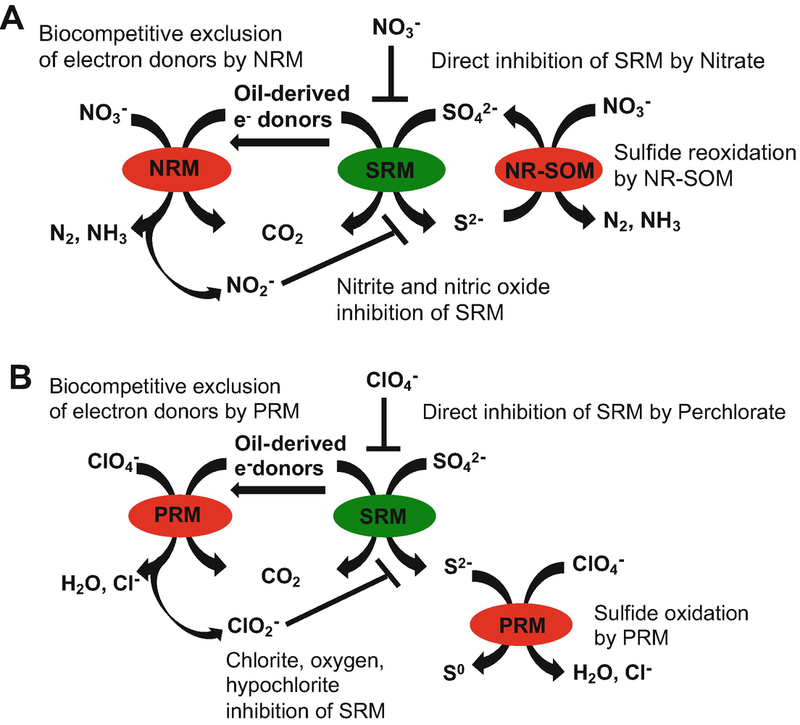 Hence, sulfide-oxidizing NRM can achieve the overall effect of biocompetitive exclusion in an indirect way that does not depend on oxidation of the exact SRM substrates that donate electrons to the souring reaction (Hubert et al. 2003). The ability of sulfide-oxidizing NRM to compete with chemoorganotrophic NRM for nitrate may determine the effectiveness of nitrate injection technology in instances where direct biocompetitive exclusion is precluded by resident SRM and NRM that oxidize different oil-derived substrates. Thermodynamic calculations suggest that chemoorganotrophs will outcompete chemolithotrophic NRM in souring control scenarios (Dolfing and Hubert 2017). PRM are also innately capable of sulfide oxidation, but the products of the reaction are shifted toward elemental sulfur rather than sulfur oxyanions (Fig. 1) (Gregoire et al. 2014; Mehta-Kolte et al. 2017). This proceeds differently than sulfide oxidation by chemolithotrophic NRM in that PRM do not grow by sulfide oxidation; rather the intermediates and enzymes involved in perchlorate respiration are very reactive with sulfide (Mehta-Kolte et al. 2017). Organisms involved in the cycling of intermediate sulfur species are often observed co-enriched alongside PRM in marine sulfidogenic systems that have received perchlorate treatment to control souring (Coates 2014). The ability of NRM to control reservoir souring via depletion of SRM electron donors according to the scheme in Fig. 1a depends on the oxidative capacity of nitrate, which in turn depends on the NRM physiology and whether nitrate is completely or partially reduced. Nitrate reduction can proceed according to two reaction pathways: DNRA (NO3− → NO2− → NH4+), which transfers eight electrons, or denitrification (NO3− → NO2− → NO → N2O → N2), which transfers five electrons. Hence, oxidation (depletion) of electron donors would require less nitrate if full DNRA rather than full denitrification were stimulated. NRM capable of both processes have been isolated from the same oil field (Gevertz et al. 2000; Hubert and Voordouw 2007), and the factors governing which group may be stimulated during nitrate injection to reservoirs remain unclear. An experimental comparison using non-oil-field strains from a culture collection showed DNRA was more energetically favorable than denitrification (Strohm et al. 2007), whereas thermodynamic modeling predicts denitrification is more energetically favorable (Dolfing and Hubert 2017). It has been suggested that DNRA may be the dominant pathway in environments where nitrate concentrations are low (Burgin and Hamilton 2007). However, nitrate reduction by oil-field NRM does not necessarily always proceed fully to the end products N2 or NH4+. When nitrate is present in excess relative to NRM electron donors, nitrite may be the end product of nitrate reduction (Greene et al. 2003; Hubert and Voordouw 2007; Grigoryan et al. 2008). This is illustrated in NRM end-product plots for organic acid (lactate) oxidation by the DNRA-catalyzing Sulfurospirillum sp. strain KW and sulfide oxidation by the denitrifying Sulfurimonas sp. strain CVO (Fig. 2). The results show that lower nitrate doses may be more likely to be converted to fully reduced end products, whereas higher doses promote nitrite accumulation. Instances could exist where adding less nitrate transfers more electrons (oxidizes more substrate) than higher nitrate doses that would be converted mainly to nitrite. 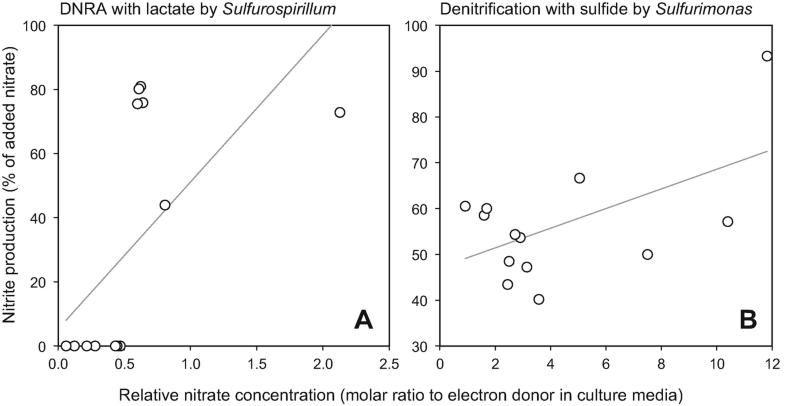 This suggests that depletion of SRM electron donors could be more efficient using a relatively low dose of nitrate in some cases. More souring control with less nitrate seems counterintuitive, and strategies based on the trends shown in Fig. 2 require a thorough understanding of the chemistry and microbiology in a particular setting. Nitrite production can be advantageous in oil-field settings since nitrite strongly inhibits SRM (Fig. 1). An important benefit of partial nitrate reduction scenarios (e.g., higher nitrate doses; Fig. 2) could be the production of significant amounts of nitrite, which appears to be a common outcome of nitrate application at high temperature (Fida et al. 2016). Some oil-field NRM produce only nitrite as an end product (e.g., sulfide-oxidizing Arcobacter sp. strain FWKOB (Gevertz et al. 2000)). Nitrite specifically blocks the dissimilatory sulfite reductase (Dsr) that catalyzes the conversion of sulfite to sulfide in all SRM (Greene et al. 2003) and is a moderately selective inhibitor of SRM (Carlson et al. 2015). As a metabolic inhibitor, nitrite is similar to a biocide and is more effective against SRM at higher concentrations. Nitrite inhibition of Dsr depends on SRM cell density; larger SRM populations require correspondingly higher nitrite doses to prevent growth and sulfide production (Haveman et al. 2004). Another important factor is whether or not the SRM being targeted encode and express a periplasmic nitrite reductase (Nrf). This feature, possessed by some but not all SRM, is effectively a detoxification strategy to alleviate nitrite inhibition of normal Dsr action (Greene et al. 2003); Nrf does not allow SRM growth via dissimilatory nitrite reduction (Pereira et al. 2000). Introducing high doses of nitrate to sour reservoirs may thus achieve multiple souring control effects. Reduction of nitrate to nitrite transfers two electrons, which would achieve oxidation and depletion of SRM substrates in proportion to the amount of added nitrate. This outcome would be complemented by a corresponding level of inhibitory nitrite (Fig. 2). For oil fields where souring control depends mainly on inhibition of SRM by nitrite, it may be less crucial to understand the nature and extent of SRM electron donors in situ. However, recent work suggests that nitrite production in many oil systems may be primarily controlled by the availability of labile monoaromatic hydrocarbons such as toluene (Suri et al. 2017) that can be oxidized by betaproteobacterial Azoarcus and Thauera spp. detected in different oil fields (Hubert and Voordouw 2007; Li et al. 2014; Suri et al. 2017). Nitrite inhibition would also be effective in situations where culprit SRM are known to have a broad substrate range (perhaps including oil hydrocarbons) and/or in reservoirs with many degradable electron donors (making them harder to exhaust via nitrate-reducing biocompetitive exclusion). Torsvik and Sunde (2005) have suggested that oil has limitless electron donors (for SRM and NRM) and that souring control mechanisms must therefore be based on SRM inhibition. As such, information on resident microbial communities will be important for developing nitrite inhibition strategies that depend on the amount of SRM biomass present, which can be estimated using quantitative assays (see Sect. 5). It may also be important to determine whether the SRM harbor nitrite reductase. Such information could be determined by pre-screening oil-field samples using molecular surveillance techniques prior to nitrate injection. If souring is caused by nitrite-resistant SRM, nitrite accumulation may be less successful, and a biocompetitive exclusion-based nitrate injection strategy for depleting bioavailable SRM electron donors should be considered. Recent work suggests that the extent of nitrite accumulation by NRM increases at high temperature (An et al. 2017) and salinity (Okpala et al. 2017). This could be due to inhibition of nitrite reductase enzymes at temperature and salinity extremes. The temperature sensitivity suggests that reinjection of hot production water could be used as a means of enhancing the efficacy of nitrate injection for souring control (An et al. 2017). Perchlorate-reducing microorganisms are unique among respiratory anaerobes in that they can produce dioxygen under anaerobic conditions as an obligate intermediate in perchlorate reduction. All respiratory perchlorate-reducing microorganisms reduce perchlorate sequentially through the intermediates ClO4− → ClO3− → ClO2− → O2 → H2O (Youngblut et al. 2016b). Perchlorate (ClO4−) is first reduced through two sequential two-electron reductions to chlorite (ClO2−) by a perchlorate reductase (PcrA) protein (Youngblut et al. 2016a, b). In canonical PRM, perchlorate reductases form a monophyletic clade (Melnyk and Coates 2015), and biochemical studies suggest that although NarG nitrate reductases are capable of reducing perchlorate, the Km for the specialized perchlorate reductase enzyme is several orders of magnitude lower (Youngblut et al. 2016a). Thus, PRM are capable of accessing much lower concentrations of perchlorate compared with nitrate-reducing microorganisms. The chlorite produced by PcrA is an exceptionally reactive and toxic intermediate and is rapidly dismutated to dioxygen and chloride ion by chlorite dismutase (Cld). Chlorite dismutation does not yield energy but produces dioxygen, a very thermodynamically favorable electron acceptor and oxidant. There are also a number of other specialized mechanisms, whereby perchlorate-reducing microorganisms detoxify reactive chlorine species such as hypochlorite (HOCl) that are formed through side reactions as minor products of perchlorate reduction. The presence of an active methionine sulfoxide reductase system in conjunction with a highly expressed methionine-rich peptide is essential to cope with these species in model PRM (Melnyk et al. 2015). The dioxygen produced through perchlorate reduction is utilized by PRM using the same cytochrome oxidase enzymes that are utilized under aerobic conditions (Melnyk et al. 2013). This oxygen is also available to the enzymes involved in aerobic hydrocarbon degradation (Carlström et al. 2015) and can potentially even be available to other organisms carrying out other aerobic metabolisms (Carlström et al. 2015; Clark et al. 2016) (Youngblut et al. 2016a; Barnum et al. 2018). The possibility of syntrophic perchlorate reduction has recently been demonstrated in pure culture (Clark et al. 2016), which suggests that PRM subpopulations could share the intermediates of perchlorate reduction. This could occur by exchange of either chlorite or dioxygen (Youngblut et al. 2016a). While this likely occurs at very low concentrations (low micromolar to nanomolar), both of these compounds are extremely potent inhibitors of SRM with IC50 values in that range (Carlson et al. 2015). Thus, as with NRM producing nitrite, PRM populations may exist that produce varying levels of chlorite and oxygen and thereby impact SRM to varying extents. Other oxyanion treatments for controlling reservoir souring have also been evaluated. 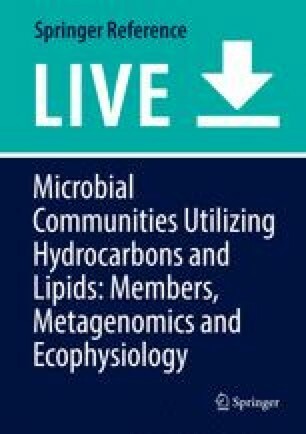 While less is known about their application logistics and impact on complex microbial communities, considering the properties and impact of these other oxyanions on oil reservoir communities provides important points of comparison with nitrate and perchlorate and identifies scenarios where combined treatment strategies may work. Nitrate and perchlorate can be effective inhibitors of microbial sulfate reduction in large part because of their capacity to serve as alternative electron acceptors and because NRM and PRM produce reactive nitrogen and chlorine species that are potent inhibitors of SRM (Fig. 1). 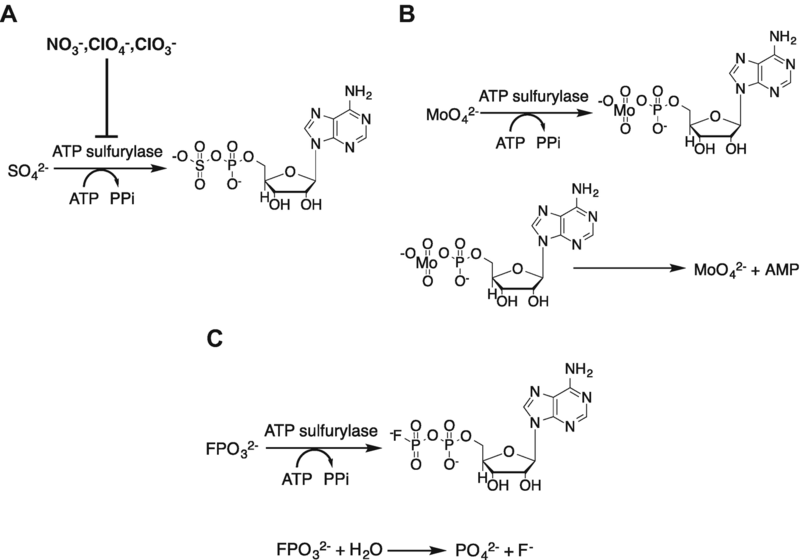 However, both of these monovalent oxyanions can also function as competitive inhibitors of the ATP sulfurylase/sulfate adenylyltransferase (ATPS/Sat), and at sufficiently high concentrations, both compounds can function as direct, selective inhibitors of respiratory sulfate-reducing microorganisms (Carlson et al. 2014) (Fig. 3). Other oxyanions function as alternative substrates of the ATP sulfurylase and are activated to generate unstable adenosine 5′-phosphooxyanions with varying stabilities relative to adenosine 5′-phosphosulfate (APS) (Fig. 3). Molybdate and tungstate, the group IV oxyanions, are particularly potent inhibitors of SRM because they form very unstable APS analogs (Peck 1959; Renosto et al. 1993; Hanna et al. 2004; Carlson et al. 2015). This is similarly true for selenate and presumably also true for tellurate (Renosto et al. 1993; Hanna et al. 2004; Carlson et al. 2015) (Peck 1959). Chromate and arsenate are also futile substrates of the sulfate adenylyltransferase, but this can be counteracted by enzymatic mechanisms for their detoxification in many SRM (Lovley and Phillips 1994; Michel et al. 2001; Li and Krumholz 2007). The net impact of these futile substrates is rapid depletion of cytoplasmic ATP and regeneration of the inhibitory oxyanion. In contrast to the futile substrates, chromate and arsenate, monofluorophosphate forms a very stable APS analog (Hanna et al. 2004) that may also function as a competitive inhibitor of the APS reductase. Monofluorophosphate is also a selective inhibitor of SRM and functions in part by releasing toxic fluoride ion in the cytoplasm of SRM that are unable to distinguish between sulfate and monofluorophosphate (Carlson et al. 2015). The relatively low toxicity of monofluorophosphate to other organisms compared to the other inorganic oxyanions makes it an attractive option. One consideration for the use of many of the divalent inorganic oxyanions is the potential for the formation of insoluble complexes with alkali earth metals such as Ca2+ and Mg2+ (Rowley and Stuckey 1956; Lide 2007). This could impact the ability of these inhibitors to move through reservoirs to reach target SRM populations but could also have the added effect of sequestering these inorganic oxyanions in mineral matrices that could then function to slowly release the inhibitor farther into the reservoirs. More research into the potential of other oxyanions for achieving souring control will shed light on these possibilities. The importance of SRM has led the petroleum industry to adopt different strategies for monitoring their occurrence in oil reservoirs and oil production facilities. Quantitative detection tools can provide useful information about SRM, e.g., before and after seawater injection and breakthrough which may allow SRM proliferation, or before and after biocide or nitrate treatments intended to curb SRM activity. Many souring control strategies depend on the inhibition and/or eradication of SRM; hence sensitive detection methods are useful for surveillance. Important considerations are the logistics of sample processing and the length of time until results are obtained and interpreted. Particular features relating to the microbial ecology of souring and nitrate addition, discussed above, may be important for correctly interpreting results when sulfide elimination is the objective. Advantages and disadvantages of different quantitative approaches are discussed below. Traditionally the oil industry has employed most probable number (MPN) analyses, sometimes referred to as “bug bottles,” for quantification of various microbial groups. Oil-field samples (e.g., produced waters, metal coupons from injection or production facilities, etc.) are inoculated into a medium containing sulfate and appropriate electron donors as dilution series and, following an incubation period, are scored based on set criteria (e.g., blackening caused by reaction of produced sulfide in iron-containing growth media). Detection of growth can require up to 4 weeks for highest positive dilutions, which in principle were inoculated with one to nine individual target cells (assuming tenfold dilution series and proportional biomass distribution during transfers, i.e., no clumping of cells). Increased sensitivity may be achieved by incubating with radioactive 35S-labeled sulfate (Vester and Ingvorsen 1998). Similar methods, with appropriately selective growth media, can be employed for enumerating NRM, PRM, and other groups of oil-field microorganisms. Detection of oil-field SRM based on the production of sulfide makes sense, since sulfide production is usually the problem in the first place. MPN testing generally does not return false-positive results; using appropriate SRM media, MPNs should reliably determine the minimum number of microbes capable of sulfate reduction that are present in a sample. A caveat to this would be samples with high concentrations of sulfide but low concentrations of SRM, underscoring the importance of incubating proper controls in parallel to SRM growth tubes. However, misinterpretation of positive results could occur, e.g., if SRM switch from fermentative metabolism to sulfate reduction, although they are not carrying out sulfate reduction in the reservoir, they may give a misleading result in the bug bottle tests. The necessary foreknowledge of media and incubation conditions that will successfully enrich reservoir microbes is a key drawback to MPN testing, given that most environmental microorganisms have not been successfully cultivated so far (Stewart 2012). The so-called unculturable fraction is often suggested to be 90 to 99% of the microbial diversity in a given environment. This ratio presumably holds true for SRM in oil-field environments; hence there is real potential for false negatives using this approach. Typical oil-field MPN counts are 104 to 105 SRM ml−1 produced water (Birkeland 2005). Dilution to extinction, inherent to the MPN approach, offers the opportunity to obtain pure cultures of culturable organisms associated with selected phenotypes in oil-field samples (e.g., Voordouw et al. 1991). Molecular methods cannot substitute live cultures for the experimental characterization of microbial physiology (e.g., determining the range of relevant phenotypes for a single organism). Pure cultures also allow straightforward whole-genome sequencing. Information from whole genomes offers valuable clues as to the metabolic potential of an organism, e.g., in an oil reservoir context, whether reactions, such as sulfate reduction, nitrate reduction, perchlorate reduction, corrosion-associated metabolism, or hydrocarbon biodegradation, could be catalyzed. In addition to obtaining genomes from pure cultures, community DNA sequencing of metagenomes to obtain whole genomes, or single-cell genomics following cell sorting, offers other ways to access this information from environmental (e.g., oil field) samples (Bowers et al. 2017) without culturing. Despite these developments in genomics, petroleum microbiology will continue to benefit from renewed cultivation efforts that employ innovative techniques and various culture media (Giovannoni and Stingl 2007; McGenity 2016). Expanding the number and diversity of cultured and well-characterized oil-field microorganisms is a good reason to maintain dilution-to-extinction (MPN) testing in the oil industry, but this requires that analyses performed by operators and service providers do not end with enumeration and continue all the way to individual strain isolation, characterization, and sequencing. Employing a wider array of selective growth media would be beneficial for this kind of initiative. High-throughput cultivation can help petroleum microbiologists address many of the challenges related to accessing culturable diversity noted above. Coupled with high-throughput 16S rRNA gene amplicon sequencing, high-throughput MPN cultivation has been shown to be successful in this regard (Justice et al. 2017). Once microbial isolates and enrichments are obtained, high-throughput cultivation can allow researchers to rapidly identify appropriate biocide or oxyanion dosing concentrations and develop tailored souring control strategies specific to a given reservoir environment (Carlson et al. 2015, 2017). In addition, approaches for continuous cultivation, such as chemostats, are promising for obtaining stable microbial communities carrying out complex metabolisms such as sulfur and nitrogen cycling (Kraft et al. 2014). In recent years the oil industry has started incorporating molecular microbiology into its surveillance. At the same time, research labs have undertaken many molecular characterizations of oil-field production fluids, increasing our understanding of reservoir microbial communities (Pham et al. 2009; Hubert et al. 2012; Lewin et al. 2014; Hu et al. 2016; Vigneron et al. 2017; Kim et al. 2018). While arguably more technically demanding than traditional MPN assays, molecular methods can provide quantitative results within hours to days rather than weeks. Differences on this timescale for managing oil production operations may translate into significant economic gain or loss. In this context it is essential to understand the reservoir microbial ecology in question, such that well-designed assays are implemented and their results interpreted correctly. There are two main approaches used by molecular microbial ecologists for quantifying specific microbial groups of interest. Fluorescence in situ hybridization (FISH) of oligonucleotide probes to ribosomal RNA (rRNA) in viable cells after their fixation allows direct counting of active microorganisms by epifluorescence microscopy (Amann and Fuchs 2008). This approach has taxonomic specificity based on the probe sequence, whereas more general DNA-binding dyes (e.g., DAPI or SYBR Green) coupled with microscopy can provide a non-specific general cell count (though this can also count dead cells). These general stains are typically used in tandem with FISH so that organisms of interest can be considered relative to overall population estimates. A different approach is quantitative PCR (qPCR) where the progress of a PCR is optically monitored in real time using similar DNA-binding dyes (e.g., SYBR Green) such that the exponential growth in the fluorescence signal allows the initial number of target sequences in a sample to be extrapolated (Smith and Osborne 2008; McKew and Smith 2015; Shen and Voordouw 2015). Application of either technique for quantifying SRM or other microbial targets in oil-field samples requires careful selection of the genetic sequence(s) being targeted and the specificity of the oligonucleotide probe or primers being applied. Non-quantitative molecular approaches that have been applied to oil-field samples include PCR-based amplicon libraries. In recent years, clone libraries, i.e., cloning amplicons into plasmid vectors for sequencing (e.g., Voordouw et al. 1996; Hubert et al. 2012) and denaturing gradient gel electrophoresis analysis of amplicons (Schwermer et al. 2008), have given way to next-generation sequencing approaches using different technology platforms, with the current state of the art for most researchers being the Illumina MiSeq platform (Dong et al. 2017; Vigneron et al. 2017). Amplicon libraries indicate the presence of some organisms but do not exclude the absence of others. Relative abundances of different taxonomic groups in amplicon libraries should be interpreted cautiously, because PCR primers tend to preferentially amplify certain taxa over others. Maintaining up-to-date knowledge for oligonucleotide probes and PCR primers is an ongoing task given the rapid and regular discovery of new microbial diversity, both in oil fields and other environments. For example, one of the earliest FISH probes used for SRM detection in microbial ecology, SRB385, was designed to target some but not all known sulfate-reducing Deltaproteobacteria (Amann et al. 1990) at a time when 16S rRNA gene sequence databases and the molecular diversity of SRM (Vigneron et al. 2018) were more limited. This probe has gained attention from the oil industry for use in SRM surveillance. However, a quick and easy analysis of SRB385 in the context of currently known 16S rRNA diversity using free online resources reveals perfect matches to thousands of known 16S rRNA sequences affiliated with non-sulfate-reducing groups, including inferred fermentative, syntrophic, and nitrate-reducing bacteria. Probe and primer sequences, like growth media for the MPN approach, represent the selective component of molecular detection assays. Careful design and testing are crucial to proper probe and primer applications in oil-field settings. The SRB385 example illustrates the potential to overestimate SRM abundance using oligonucleotides with broader than intended specificity. On the other hand, specific probes or primer sets for SRM 16S rRNA targets may also lead to underestimates due to less than intended coverage and specificity for the target group. As noted above, SRM are phylogenetically diverse, belonging to at least five bacterial and two archaeal phyla (Stahl et al. 2009). In cases where specific SRM known to plague a particular oil field are to be monitored, a 16S rRNA gene sequence corresponding to that particular organism or clade may represent a good molecular marker for quantitative surveillance. Multiple 16S rRNA assays are required to confidently screen for all known SRM. Alternatively, qPCR-based detection of metabolic genes of SRM such as the dissimilarity sulfite reductase (dsrAB) offers another strategy for specific detection of these organisms (Müller et al. 2015; Vigneron et al. 2018). While metabolic genes offer good targets for specific qPCR assays, FISH targeting metabolic genes has also been developed (Moraru et al. 2010; Barrero Canosa et al. 2017). Abundances of genes encoding enzymes catalyzing various steps in nitrate reduction pathways (Sect. 3.3) have also been assessed by qPCR in different environmental samples (Henry et al. 2006; Smith et al. 2007, 2017). Similarly, perchlorate reduction genes can also be detected in amplicon libraries (Bender et al. 2004) and in metagenomes (Barnum et al. 2018). Sulfide-oxidizing microorganisms that contain homologous aps and dsr genes to those in SRM and catalyze reverse reactions (Stahl et al. 2007) could potentially complicate interpretation of results from SRM metabolic gene assays from oil-field environments, especially in situations where, in response to SRM activity, nitrate injection stimulates sulfide-oxidizing NRM (Figs. 1b and 2b). Targeting dsr may hold more promise in this regard since it forms distinct clades in sulfate reducers and sulfide oxidizers (Loy et al. 2009), whereas aps from these two groups are phylogenetically interspersed (Stahl et al. 2007). Other caveats of dsr used as an oil-field marker are its occurrence among some fermentative and syntrophic Desulfotomaculum spp. that may have lost the ability to reduce sulfate (Plugge et al. 2002; Imachi et al. 2006) and the fact that some SRM are also capable of nitrate reduction (Seitz and Cypionka 1986; Dalsgaard and Bak 1994; Plugge et al. 2002). These organisms, if present, would still respond to dsr-based detection assays (or MPN assays using SRM growth medium) even when displaying these non-sulfate-reducing phenotypes in situ. Assays that monitor real-time generation of cDNA reverse transcribed from mRNA using a dsr-specific primer (Chin et al. 2008) could offer a work-around to avoid false-positive results from organisms not expressing their dsr; the success of this strategy would depend on sampling and RNA extraction protocols relative to the short half-life of microbial mRNA (Frias-Lopez et al. 2008). Despite the alternatives that various metabolic gene targets offer for molecular surveillance, in oil-field microbiology, as in many other subdisciplines of microbial ecology, 16S rRNA genes (for amplicon diversity surveys and qPCR) remain widely used biomarkers. Another culture-independent strategy to monitor the activity of SRM in situ, rooted in biogeochemistry rather than in molecular biology, is to measure the isotopic shift in sulfate to detect sulfur cycling in the reservoir relative to injection waters (Hubert et al. 2009; Hubbard et al. 2014). While hydrogen sulfide production, sulfate consumption, or the presence of SRM may be difficult to detect, isotopic methods to measure the imprint of sulfur cycling via sulfate isotopic composition are extremely sensitive and can be used to detect early-stage souring. Adopting isotopic fractionation as a monitoring approach could give oil-field operators time to focus resources on problem reservoirs and implement the other approaches outlined above to identify actionable solutions and to monitor the efficacy of nitrate, perchlorate, or other treatments. The best molecular monitoring will always result from a combination of various strategies including those discussed above. However, comprehensive approaches may not always be compatible with the important and “real-world” objectives of rapidly generating results that can inform field operators concerned with maintaining high oil production rates while minimizing harmful effects of souring. In some instances, thorough early-stage characterization that includes MPN enumerations and strain isolation may allow probe or primer selection for targeting important microorganisms known to be present, and responsive to perturbations, in a particular oil reservoir. In addition, microbial diversity assessments through amplicon library and/or metagenome sequencing are highly recommended as early as possible in the oil reservoir production life cycle, i.e., initial formation water samples obtained from production fluids during primary production, before injection of other fluids like seawater that can trigger reservoir souring by SRM. Similar microbiological analysis of the injection fluids is also recommended for a more thorough assessment of whether or not signatures in microbial diversity profiles are likely to represent organisms indigenous to the subsurface. Routine testing using carefully developed molecular strategies can be complemented by occasional H2S-based MPN assays, stable isotope analyses, and additional SRM probe/primer sets to introduce degrees of quality assurance for the overall surveillance strategy. Many oil companies have a good understanding of reservoir souring caused by SRM and have in recent years started introducing nitrate to alleviate souring problems at different production operations. In order for nitrate injection technology to be employed successfully in the years ahead, a more robust understanding of the underlying microbial ecology will be needed. The industry must move beyond a simple awareness that nitrate can work and gain the ability to distinguish NRM-based souring control mechanisms (Fig. 1) in different settings. This understanding will be instructive for troubleshooting instances when nitrate addition stops working at given production operations. We may learn that reservoir microbial ecology relevant for oil production is largely specific for given oil fields. However, as more case studies are undertaken, common patterns will likely emerge. In this respect, case studies involving perchlorate are needed to assess its efficacy in the field, and these can be compared to nitrate injection case studies. Developing and applying the suite of surveillance tools discussed in Sect. 5, particularly the newer molecular methods and next-generation sequencing strategies, will continue to be an important and exciting feature of modern petroleum microbiology. The critical task of designing appropriate probes and primers for oil fields will parallel the practical goal of seeing these techniques adopted as routine aspects of microbiological monitoring by oil producers. Meeting these challenges will require a successful collaboration between microbiologists and oil producers seeking an improved understanding of microbial ecology in subsurface petroleum habitats. The authors wish to acknowledge the financial support from the Campus Alberta Innovates Program to CRJH and from the UC Berkeley Energy Biosciences Institute to HKC.